This Friday, Alliance for Community Choice in Transportation (ACCT) is hosting their 1st annual Bike Extravaganza at Cityspace on the downtown mall between 6 -9 PM. 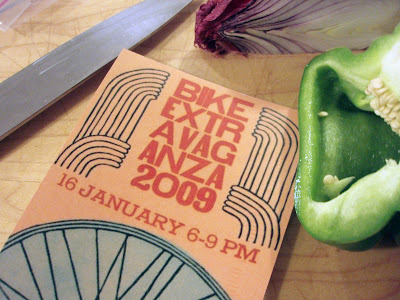 Expect bicycles, expect extravagance, expect lots of fun people. "Like motorcycle riders, bicyclists have their own subculture. They dress oddly. They dodge cars. They like to toss parties and talk of two wheels." Dress oddly? Recreational cyclists may don the spandex from time to time, but bike commuters usually just wear what they are wearing to work. There may be more brightly colored jackets, but that's less of a fashion statement than a method for not getting run over. The whole subculture label is something that, I think, ACCT is trying to counteract. For everyone from adolescents to grandparents, bike commuting is simply a mode of transportation with a variety of positive benefits. It's not a subculture. At least that's how I see it. Bryan MacKenzie tends to write in that kind of weird, standoffish style. Thanks for calling him out on it.